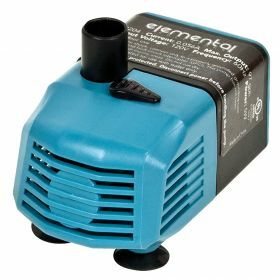 Elemental H2O Pumps feature waterproof motor casing, durable ceramic shafts, corrosion-resistant housing and adjustable flow rates for excellent performance. The submersible 5W H2O Pump pushes 97 gph and has a maximum head of 2.45’. This product is UL listed and carries a one-year warranty. 1/2" Fitting for connecting to standard 1/2" ID flexible tubing. Changed your mind? No worries! All unopened and unused merchandise, unless otherwise indicated, may be returned within 30 days from the original invoice date for a refund, no questions asked. * A 15% restocking fee may apply. © 2004-2019 Allied Aqua, LLC. All Rights Reserved.